Russell and Sheila Brown have been blessed with almost fifty years of marriage. In this day and age where more than half of marriages end up in divorce, that is indeed a great blessing. But as if good health and family are not enough blessing, the couple have just been declared the latest million-dollar winner of the Lotto 6/49. Sheila says this is the second time they have won, the first a donor lottery that gave Russell a lung transplant. 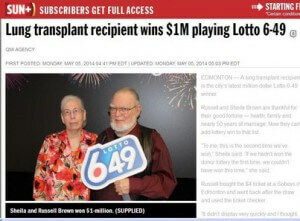 Without the donor lotto win, Russell could not have bought the winning $4 ticket from Sobeys in Edmonton. Russell had to check twice the day after the draw to believe he had indeed won big time. And his wife will not even believe him when he told her the good news.